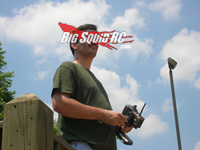 ASK Cubby, 07.10.2014, Version- Ask Away, I Might Even Respond « Big Squid RC – RC Car and Truck News, Reviews, Videos, and More! Hey Cubby I hope this ends up on Big Squid. I have saved up about 40 bucks to spend on go fast parts for my Rustler. Tell me, is 40 enough to even make a difference? Cubby- Yo what’s up Charlie. Yes, your question has made the big-time, shoot us your snail mail for a free sticker pack. Is $40 enough to make your Rustler go faster? While some people might snicker at you, I will not. No, 40 clams, won’t make a huge difference, but it is more than enough to gain some speed. Btw, I am going to assume you have the electric version here, if you happen to have the nitro please just beat it with a hammer until dead. Pinion gears are a really cheap way of gaining speed on your electric Rustler. A Robinson Racing pinion for your truck only costs about $4 and can definitely gain you some rip. I would recommend picking up a couple of new pinions, one with about 2 more teeth than you currently have, and another with 4 more. The larger sized pinions will give you more top speed, but keep an eye on your motor temp to make sure you don’t get it too hot. A motor temp under 160 F is a good place to be, if you get it too hot you will ruin the magnet inside. Don’t have the cash for a temp gun? Find a cheap one. The old school spit test only lets you know after your magnet has been baked. Oh and… while a larger pinion will gain you some top speed, you will end up losing runtime. If you were to pop on a smaller pinion, you would gain runtime but lose top end speed. One more thing, if your truck has a brushed motor, giving it a good water dipping will also give it more power/speed. That’s it for this week, you know the drill shoot me your questions to Cubby at BigSquidRC.com. Make the big-time get free stuff.